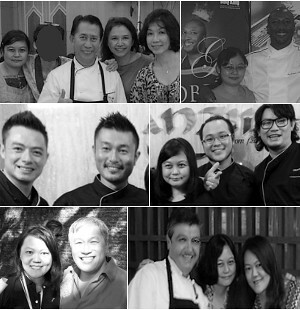 I light up when I see fresh seafood in large sizes - big prawns, big squid, big crabs! It's like being in underwater wonderland. I don't buy it often but when I do, I get as excited and cheerful as Mr. Krabs when he sees a dollar. In me best pirate voice:"Arr...what shall I do with you, calamari beauty?" 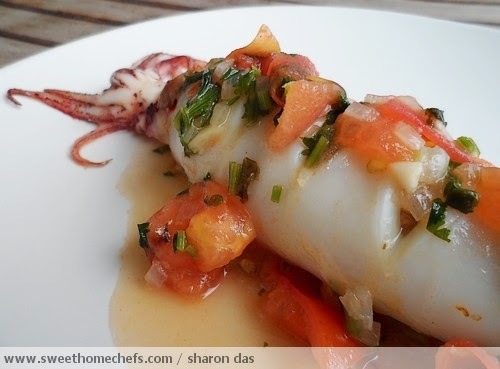 I decided to make a one-dish wonder - stuffed squid covered in rich lemony tomato sauce. We eat rice almost on a daily basis. I'm used to cooking several side dishes to go along with it. So, I wouldn't consider this too much work. The only difference? It's all going to be served on one plate! 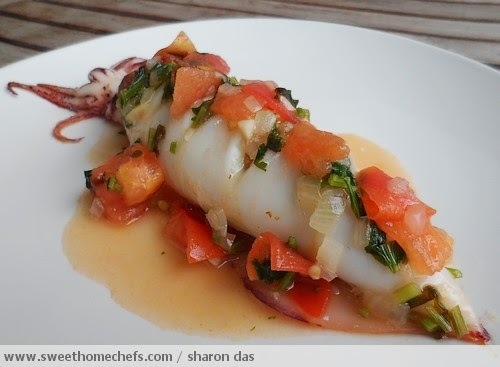 Check out the recipe below for my version of stuffed squid. 1) Plunge squid into hot water and remove quickly. The goal is not to cook it. I do it so that there's less water seeping out from the squid when it's baking midway. It also makes it easier to stuff. 2) Stuff squid with fried rice. 3) Use toothpicks to pin the squid head back on. Make small cuts on top of the squid (shown in the photo below). 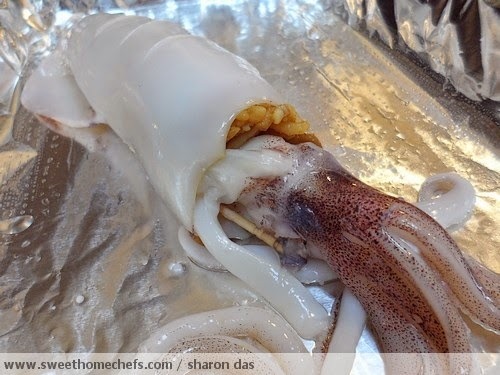 4) Place squid on a greased baking dish. Baste squid with cooking oil. 5) Bake uncovered in a pre-heated oven at 160c for 15 minutes more or less until the squid is cooked. 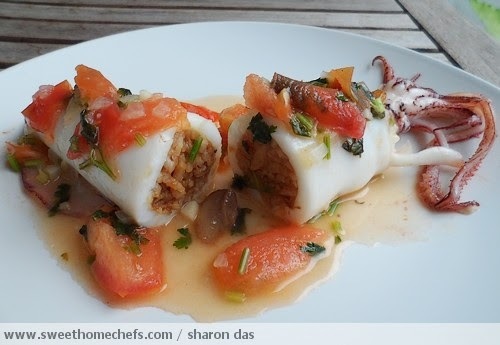 6) Pour lemon tomato sauce over baked squids before serving. 1) Heat oil in pan. Add onions and garlic. Fry until lightly browned. 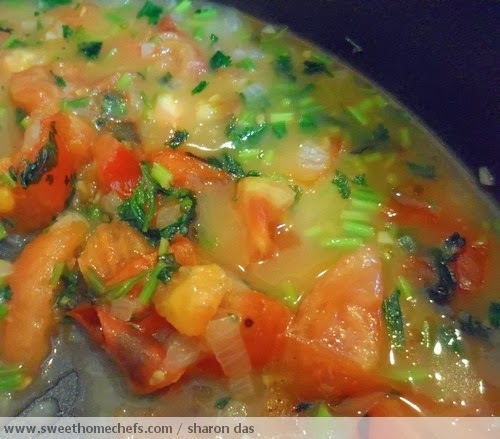 2) Add tomatoes, water and sugar. Scrape some lemon zest in, then squeeze lemon juice into the mix. Stir well and cook until tomatoes look smashed. 3) Season with a pinch of salt. 4) Turn the heat off and stir in the cornflour. 5) Add fresh coriander. Mix well. 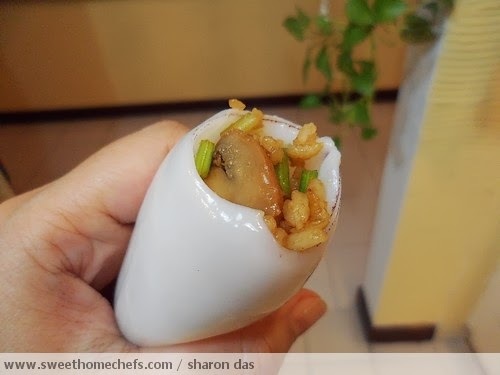 6) Serve on top of baked stuffed squid. 1) Heat oil in pan. Fry garlic until lightly browned. 2) Add mushrooms, chili and beef strips. Stir until beef strips are cooked. Add soy sauce and a bit of water (enough to help coat the rice brown). Then, add white rice. 3) Season with salt, pepper and lemon zest. Mix well. 4) Turn the heat off. Add fresh coriander and mix well. 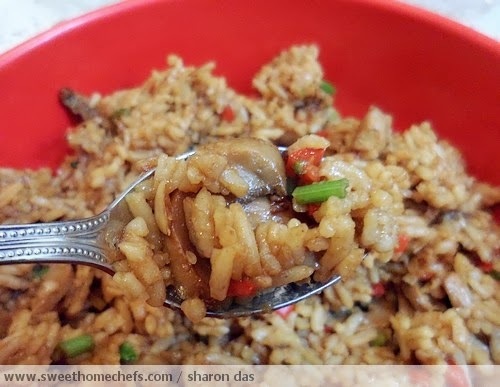 5) Stuff this rice into the squid.